Summer's here, and hopefully, sunny weather isn't far behind. Sometimes the beach is just too far. Sometimes you just want to know exactly what lies beneath the surface. Sometimes you just want to cool off at a pool. Even if the chlorine turns your hair green. 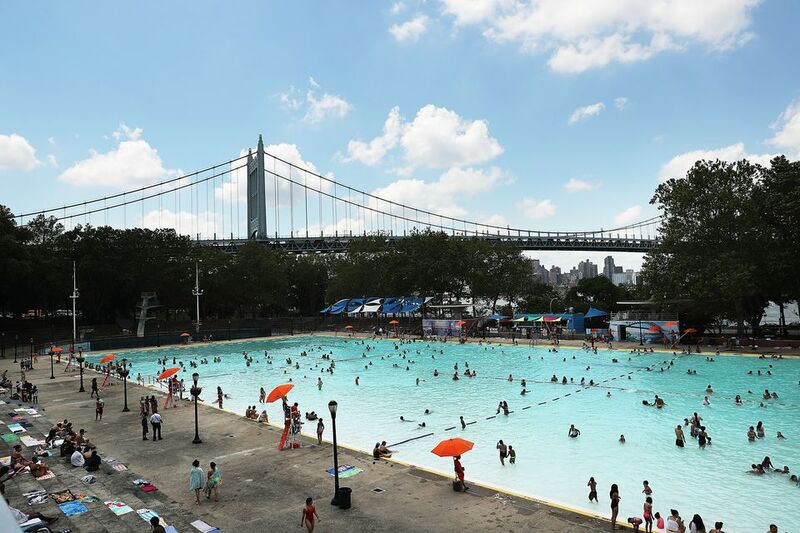 Thanks to the NYC Parks Department, there are many pools in Queens where you can get your Marco Polo on. The NYC Parks' Citywide Aquatics offers free swim classes for toddlers and older kids at some of these outdoor pools. They also run swim teams for kids ages 6 to 18. For more info, including adult lap swim programs, call 718-760-6969. You must buy a membership to use the indoor pools ($75 per year for adults; $10 per year for seniors; free for children under 18). The indoor pools are open year-round, and the outdoor pools open June 27, 2009. This giant pool (330 feet long) has to be seen to be believed. The WPA project is the oldest pool in the city, and oh, the views! Open 11am-3pm and 4-7pm. Closed on Wednesdays. Park in the Little Bay parking lot just outside the entrance to the fort. Sometimes there's a shuttle bus. If not, it's about a 10-minute walk. 173rd St & 106th Ave, Jamaica 718-657-4995 A 3-foot-deep pool and a huge deck that can hold about 600 people. The wait to get in can be long at this medium-sized pool. Small pool named for a winner of a big prize. Pool and playground in eastern Queens. A mini pool was added to this playground in 2007. This new Olympic-size pool has a diving tank too. For more indoor pools, check out the YMCA's Queens branches.